Like many ultra-wide lenses, the Sony 12-24 F4 G (SEL1224G) has a bulbous glass element that protrudes from the front of the lens, there is also no filter thread. This lens design makes it very difficult to use standard filter holders. Thankfully there are some holders that have been designed specifically for the Sony 12-24 lens. So far I know of only 3 companies who have developed a filter holder for the 12-24, these are: Nisi, Kase, and Fotodiox. If you know of any others, please let me know in the comments below. The Nisi S5 150mm filter holder is constructed with aluminium alloy using CNC technology. It includes an integrated rotating PRO CPL that can be rotated using gears on the back of the holder. It also supports two 150mm filters without vignetting through 360 degrees of rotation. Sony Ambassador Mark Galer gives a great demonstration of the Nisi S5 in this video. The Nisi Q 150mm for the Sony 12-24 F4 lens also supports two rectangular filters with no vignetting. However, it does not include or support an additional circular polarizer like the new S5 model does. This video from Nisi demonstrates the NiSi Q 150mm filter holder on the Sony 12-24. The Kase 150 filter holder is designed using 6063 aviation aluminium-alloy and supports their Wolverine 150 x 150 & 150 x 170mm square filters. It can hold up to 3 x 150mm filters, this includes the option for a 150mm square CPL filter. Further details on the Kase 150mm can be found here. The Kase 150mm holder costs £127 and can be purchased directly from the Kase Online Store. There are currently no distributors in the US/Canada unfortunately. 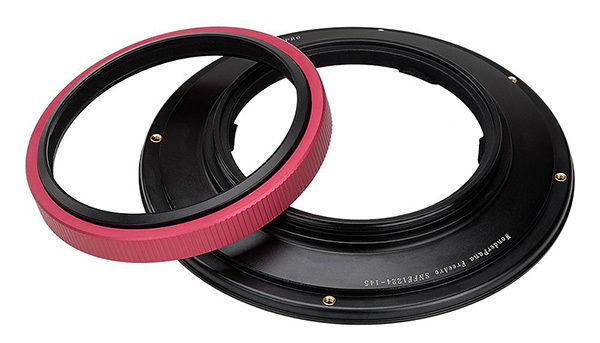 The Fotodiox WonderPana filter holder for the Sony 12-24 is designed for 145mm filters. Are you using any of these filter holders already? It would be great to know your thoughts in the comments below. I don’t own the Sony 12-24, but it’s most definitely on my wish list!